Abstract: Importance of breakfast in children. What role may yogurt have? 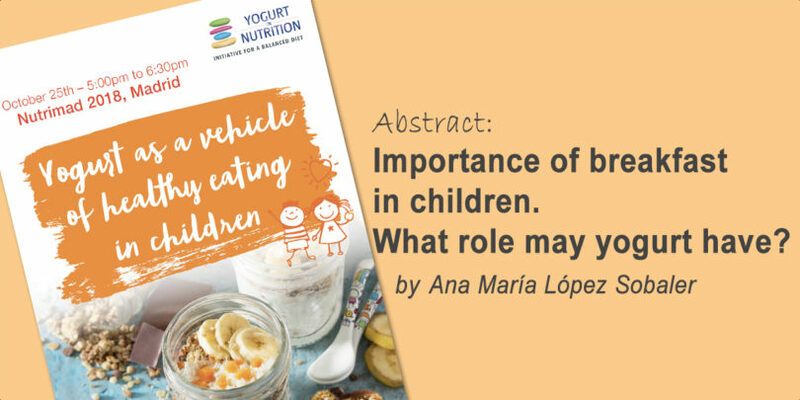 The central theme of this new YINI symposium, organized on the 25 October, from 5:00 to 6:30 pm, is “Yogurt as a vehicle of healthy eating in children”. Discover below the abstract of Ana María López Sobaler. Importance of breakfast in children. What role may yogurt have? Breakfast is one of the most controversial meals, and its importance is often questioned. However, there are numerous studies that link the habit of eating breakfast with a better nutritional status and better health in general. In the ALADINO study, for example, conducted in Spanish children between 6 and 9 years of age, skipping breakfast regularly was associated with a higher BMI and a higher percentage of schoolchildren with obesity (AECOSAN, 2016). Eating breakfast is also associated with better diet quality in school-age children and a higher intake of nutrients in general (Ramsay et al., 2018), which highlights the important role of this meal as a vehicle for foods that do not tend to be eaten at other times of the day or that are eaten in insufficient quantities. One of the criteria used to define a good quality breakfast is the inclusion of cereals, dairy products and fruit in the meal as a minimum. However, fewer than 3% of the Spanish schoolchildren in the ALADINO study included these three food groups in their normal breakfast, with a dairy product and a cereal being the most frequent combination. On the other hand, in the ENALIA study, conducted in a Spanish population between 6 months and 17 years of age, it was found that the average consumption of dairy products and fruit was low with much scope for improvement, and that a high percentage of schoolchildren and adolescents had an insufficient intake of nutrients such as Calcium, Folate or Vitamin D (López-Sobaler et al., 2017). In this regard, yogurt is a food of high nutritional density, and its incorporation into breakfast may help to improve the intake of some of the nutrients which people are not eating enough of. The incorporation of yogurt may also serve as a vehicle for including other foods such as fruit. AECOSAN (Spanish Agency for Consumer Affairs, Food Safety and Nutrition). Ministry of Health, Social Services and Equality. Estudio de vigilancia del crecimiento, alimentación, actividad física, desarrollo infantil y obesidad en España 2015. Madrid, 2016. López-Sobaler AM, Aparicio A, González-Rodríguez LG, Cuadrado-Soto E, Rubio J, et al. Adequacy of Usual Vitamin and Mineral Intake in Spanish Children and Adolescents: ENALIA Study. Nutrients. 2017 Feb 13;9(2). pii:E131. Ramsay SA, Bloch TD, Marriage B, Shriver LH, Spees CK, Taylor CA. Skipping breakfast is associated with lower diet quality in young US children. Eur J Clin 2018 Apr;72(4):548-556.